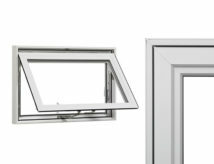 Awning windows are a type of casement window that is hung horizontally and hinged on top so that it swings outward like an awning. Awning Windows are an effective window for allowing maximum ventilation as well as preventing elements such as rain from entering the home. Awning Windows can be used independently or used in conjunction with additional awning windows or fixed panels to make a larger window. Available with or with out Brickmolds. Multi-point locking hardware. Stainless Steel Hinges and Sash Tracks. Heavy duty Folding Hardware for smooth and concealed operation.